MANILA, Philippines - ABS-CBN News and Current Affairs head Ging Reyes has confirmed today that reporter Atom Araullo officially filed his resignation from the reportorial duties for TV Patrol, Bandila, and news channel ANC. “Atom Araullo had filed his resignation from his reportorial duties but will remain a camera talent of ABS-CBN News and Current Affairs as an anchor in Umagang Kay Ganda and Red Alert," Reyes told Manila Bulletin. "He said he arrived at this decision to be able to pursue other endeavors that would also help him grow as a journalist and as a host. He is aware that the news organization has included him in its future plans and will continue to assign him stories, coverage and events, befitting his position as a journalist,” Reyes added. On Saturday, 'Atom Araullo' became a trending topic on Twitter as netizens have mixed reactions and speculations as to why the popular reporter resigned from his post. In a report by gossip blog Fashion Pulis, it says that "Araullo has been expressing strong opinion on issues, such as the controversy surrounding the burial of former President Ferdinand Marcos at the Libingan ng mga Bayani and certain policies of the present administration." "Thus, instead of being accused as a biased reporter and thereby affect the integrity of the News Department, Araullo opted to resign," the report added. On Twitter, Araullo aired his side about the long-time issue on Marcos burial at the 'Libingan' : "Ferdinand Marcos is no hero. He does not deserve honors from the state, representing the people. Did we not settle this debate 30 years ago?" Captured tweets of Atom Araullo about former president Ferdinand Marcos. 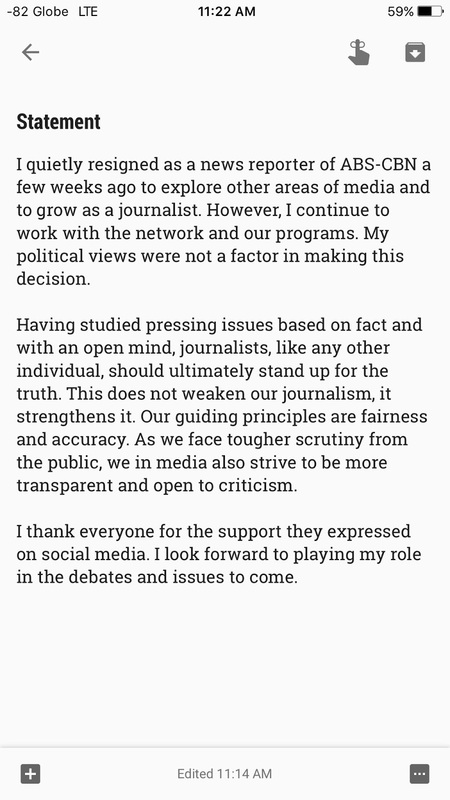 UPDATE: Atom Araullo on Sunday has released statement through Twitter to clarify the reason behind his quiet resignation as news reporter of ABS-CBN. He emphasized that political views were not a factor for his decision. Born to an activist family, Araullo spent most of his early childhood days with his parents battling it out during the Marcos dictatorship. This has exposed him to the political struggle in the country. He studied elementary education at the Ateneo de Manila, and finished high school at the Philippine Science High School. He completed his Bachelor of Science degree in Applied Physics from the University of the Philippines (Diliman Campus) where he became chairperson of the Student Alliance for the Advancement of Democratic Rights - UP (STAND-UP). After graduation, Araullo became a segment producer for ABS-CBN then eventually became a field reporter a couple of years after.